•	Walks must not cross any hazardous terrain (e.g. cliffs, very steep slopes, water hazards etc). 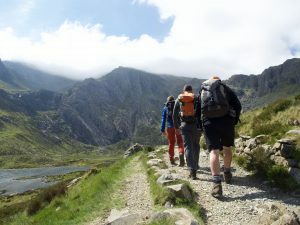 •	Throughout the walk the group should never generally be more than 3km away from a key access point such as a car park, lay-by or populated area. Any potential escape routes should also lie within the scope of the defined terrain for the Lowland Leader award. •	Walks will require the ability to plan routes, use simple navigation skills using a map and compass and be self-sufficient. •	Walks must follow paths or tracks that are both marked on a map and clearly visible on the ground and that do not require navigation across untracked areas. •	Walks must use bridges or other recognised water crossing points. •	Walks must only take place in summer conditions (i.e. when there is no unavoidable snow or ice on any part of the route). The Mountain Training Lowland Leader Award Assessment (LLAA) is a 2 day course. The Lowland Leader Award trains and assesses candidates in the skills required to lead others on walks in lowland countryside and woodland following the criteria above.